Osborne Transformer is a market leader in the design and production of premium quality current transformers. If your facility requires extremely durable current transformers, you’ve come to the right place. Osborne’s current transformers offer unmatched performance and longevity. The Institute of Electrical and Electronic Engineers defines a current transformer (IEEE Std C57.13) as “a transformer intended to reproduce in its secondary circuit, in a definite and known proportion, the current of its primary circuit with the phase relations substantially preserved”. Its primary winding is connected in series with the conductor carrying the current to be measured or to be controlled and its secondary winding is connected to the measuring, protection or control devices. Osborne’s designs and manufactures current transformers which are used for instrumentation applications, others which are used for power system synchronizing applications and others which are used in protection circuit application. They have been designed to meet specified current ratios, burden impedance and transformation errors. Do you want your customer to worry about how or when their current transformers will fail? Of course you don’t, because when current transformers fail, it’s can be dangerous! 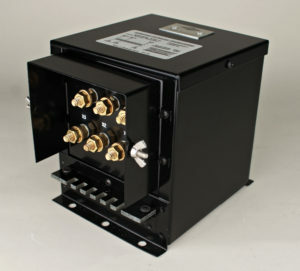 Be confident that Osborne’s unrivaled current transformers will be a great fit for your project. Contact Osborne’s engineers today and let them quickly prepare a preliminary design proposal — FREE OF CHARGE. You can trust Osborne’s no-nonsense approach. Specifying the ideal current transformers will not be a complicated experience.